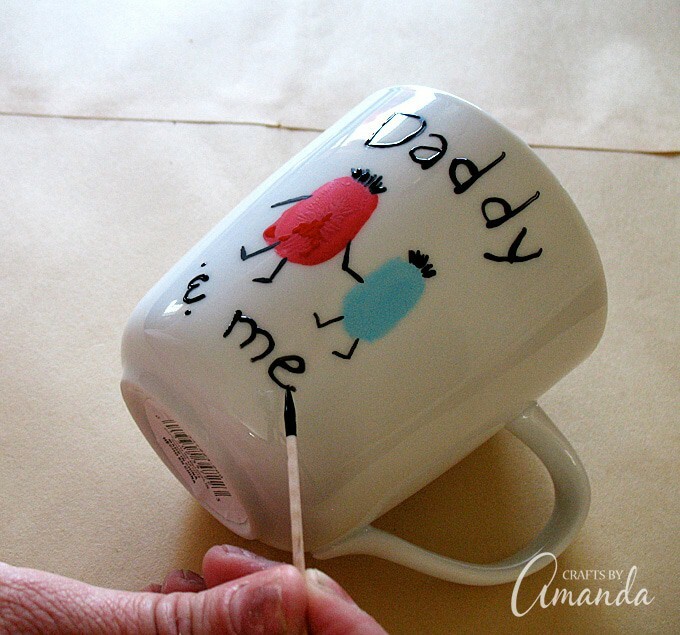 Use your child’s fingerprints and paint to make a useful keepsake Father’s Day mug. This simple but adorable fingerprint Daddy & Me mug says it all! Great for Father’s Day or a birthday and perfect for taking to the office. 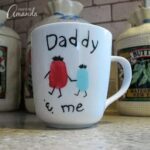 When I originally created this Father’s Day mug project several years ago I used enamel paint and a toothpick as you will see in the step photos below. However, I am including a suggestion for paint pens in the steps and supply list. They are much easier to use! Acrylic paints will wash off this mug. However, if the mug will be used for decorative purposes only you may use acrylic paints and coat with acrylic sealer. Wipe clean with a damp cloth when needed. Check your local dollar store for inexpensive mugs. Personalize this mug even more by writing your dad’s first name on the other side. Be sure that coffee mug is clean and dry. 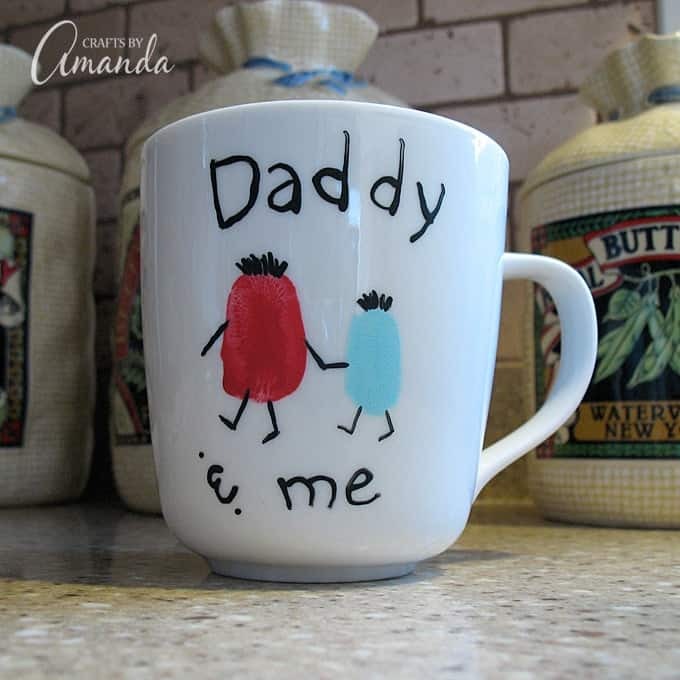 Use child’s thumb and red enamel paint to add the “daddy” figure on the cup. You can make the figure larger if it looks too small. 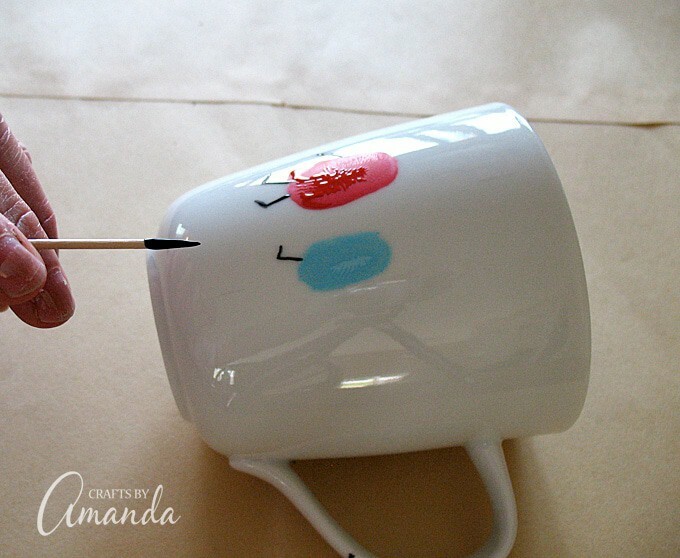 Use blue paint (or pink for a girl) and pointing finger to add the child to the cup. Use a thin paint brush to draw on legs and arms. Connect arms between characters so that they are holding hands. Use a thin paintbrush to add hair. Use a thin paintbrush to write “Daddy” above the characters and “& me” below the characters. Bake your Father’s Day mug in the oven as directed on the back of the enamel paint bottle. You can also air dry, however, air drying requires many days as opposed to a few hours in a low temp oven. 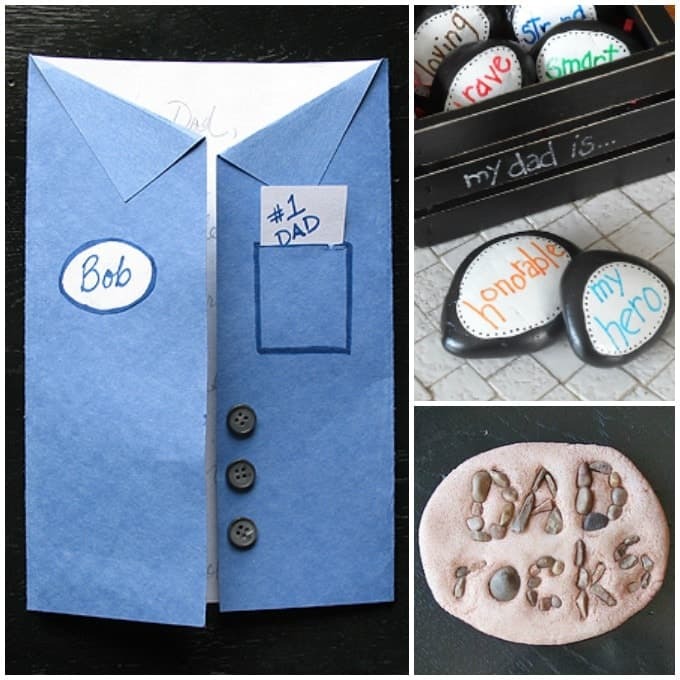 These Father’s Day Hero Stones are a great project for kids to make and give to their dads. A wonderful gift dad can keep on his desk, awesome as paperweights! Does your dad work in the service industry? Maybe he’s a mechanic or a carpenter? Not everyone wears a white shirt to work! Make this blue collar Father’s Day card today. This is the most popular Father’s Day craft on this blog. Make a salt dough Dad Rocks paperweight with the kids! Want even more free craft ideas? Be sure to subscribe to my newsletter for FREE and craft ideas sent to your inbox every week. 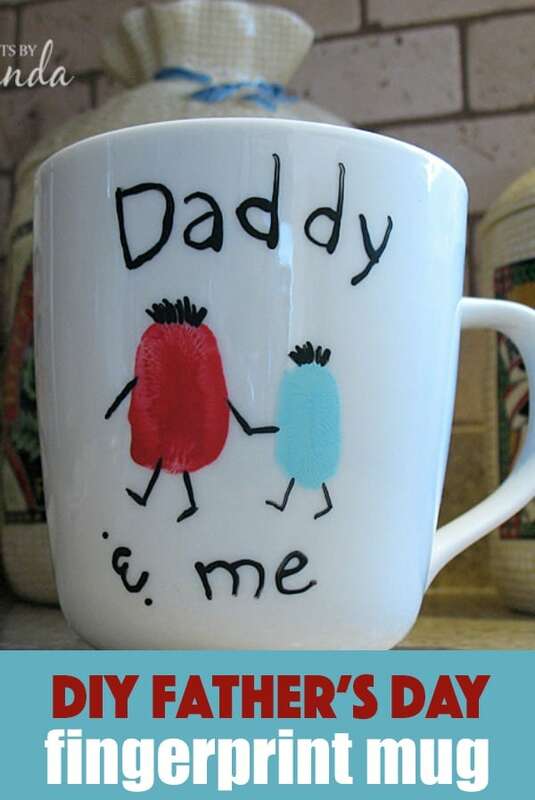 This adorable Father's Day mug uses a child's fingerprint to create a cute daddy and me message. The perfect keepsake gift for dad! 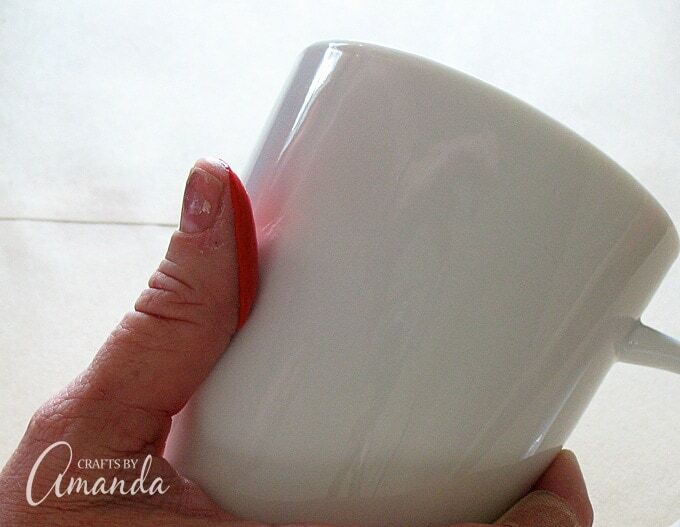 Use child's thumb and red enamel paint to add the "daddy" figure on the cup. You can make the figure larger if it looks too small. Use blue paint (or pink for a girl) and pointing finger to add the child on the cup. Use a thin paint brush to draw on legs and arms, connect arms between characters so that they are holding hands. Use thin paintbrush to add hair. Use thin paintbrush to write "Daddy" above the characters and "& me" below the characters. Bake mug in the oven as directed on the back of the enamel paint bottle. You can also air dry, however air drying requires many days as opposed to a few hours in a low temp oven. 1. Acrylic paints will wash off this mug. However, if the mug will be used for decorative purposes only you may use acrylic paints and coat with acrylic sealer. Wipe clean with a damp cloth when needed. 2. Check your local dollar store for inexpensive mugs. 3. Personalize this mug even more by writing your dad's first name on the other side. This project was created by Amanda Formaro, originally for Kaboose/Spoonful. Originally published on this blog on June 1, 2016. Do I need to use a oil based enamel or can I use a water based enamel. I would like for the mug to be dishwasher safe. As long as the manufacturer states on the paint bottle that it’s made for painting on glass or ceramic and dishwasher safe then you will be fine. After it has been in the oven and baked according to the instruction on the paint bottle, can the mug be used to drink from? Will it be dishwasher safe? Yes it will be safe to drink from. To determine if it’s dishwasher safe, please check the paint bottle instructions. For my painted dishware, I wash them by hand just to be safe. My son and I loved this idea. We already got the white mug and are on our way to get the paints. I will look for the paint pens also as I have never done this kind of craft. Thank you for sharing this great and simple project! This is a really simple and cute idea for fathers day! Thanks for sharing this. My son and I have a meaningful art project to complete this weekend! This is so cute!! I want to make one for myself. Should I do both sides of the cup or just one side?